Pandaw River Cruises will begin luxury 8-night cruises into the spectacularly wild heartland of Borneo in July, a jungle region little-visited by tourists because of its remoteness. 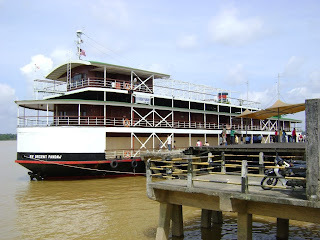 The replica colonial-era riverboat, Orient Pandaw will carry just sixty guests in thirty staterooms, sailing the swift-flowing Rajang River from Sibu to Kapit, the wild Pelagus Rapids, Song, Sarikei, Tanjung Manis and back to Sibu. Cruise prices will include all meals with a choice of both Western and Asian cuisine, local beers and spirits, soft drinks, tea and coffee, gratuities, and daily guided shore excursions; prices will begin from US$4995 per cabin twin occupancy and from US$3255 single use. Air will be additional. The brand-new Orient Pandaw will give guests the chance to walk remote villages of one-time Iban headhunters, trek jungle paths, travel by longboat amidst an abundance of wildlife and tropical flora, and discover historic forts, palaces and other colonial vestiges from an era of rule under Britain's white Rajas. Or just sit back on the sundeck and take it all in from there. ADDITIONAL CRUISE INFORMATION: Prosperous Chinese shop-house communities that give a glimpse of what Singapore and Bangkok would have been like a half-century or more ago, will also be found on these cruises, often side-by-side with modern bars, café's and shops. And traditional songkat textile and weaving workshops, tropical fruit plantations, pepper farms, logging camps, schools and river stations will be included in daily shore excursions, with of opportunities for jungle walks. 25% off Fiji Whenever You Want to Travel!